Electrode Cleaning Solutions: Clean the liquid junction of your electrodes once a day or at least once a week to prevent clogging and to maintain accuracy. 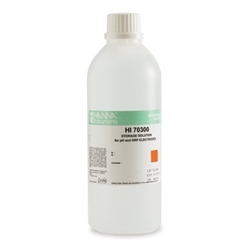 Storage Solutions: Hanna storage solutions are prepared with high grade Potassium Chloride and Potassium Hydrogen Phthalate by titration with NIST 2201 standardized Silver Nitrate and NIST 84j standardized Sodium Hydroxide Solution, respectively. ORP Pretreatment Solutions: By conditioning your ORP electrodes in a Hanna pretreatment solution you can speed up your measurements.